The Cuisinart CSG-900 is a wireless dual probe grilling thermometer. The food probe can be inserted 6" into meat and the thermometer's backlight makes nighttime grilling easy. The timer lets you have multiple options when it comes to tracking grill and meat temperatures and either set a time, or let it tell when grill and meat are at the right temperatures. Hosting is easier when the wireless dual probe grilling thermometer lets step away from the grill and relax, knowing alerte will be indicated when everything is grilled to perfection. You can monitor grill and meat temperature from up to 300 feet away with two temperature probes. 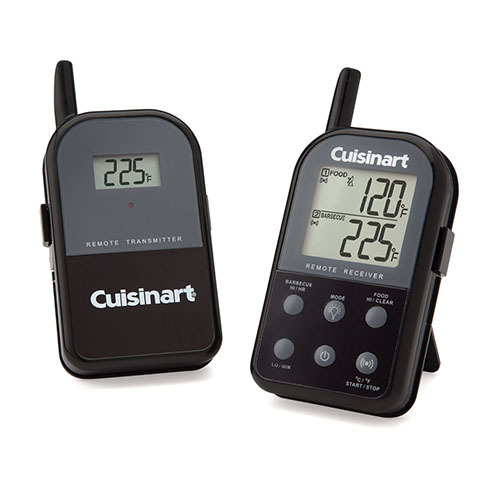 The Cuisinart Dual-Probe Digital Wireless Thermometer has many exciting features for users of all types. 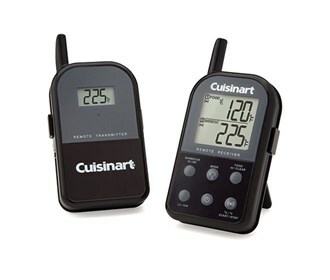 You can extend the lifetime of your Cuisinart Dual-Probe Digital Wireless Thermometer with the purchase of a FactoryOutletStore Factory Protection Plan. See the Cuisinart Dual-Probe Digital Wireless Thermometer gallery images above for more product views. The Cuisinart Dual-Probe Digital Wireless Thermometer is sold as a Brand New Unopened Item.